Yeti are a band that jovially describe themselves as “Just some good ol’ dudes playin’ some heavy metal!” There is a refreshing absence of inverted crosses and Baphomets on their social media profiles, and the music is equally derivative of their outlook. The EP’s cover doesn’t make this apparent at first. It depicts an American family going in the kitchen about their business, while adorned with gas masks amid a mushroom cloud visible through the window, which made me think that this was going to be something in the neighborhood of Dystopia or Final Conflict. Instead, the music is Pelican and Daylight Dies, filtered through a Black Sabbath lens. 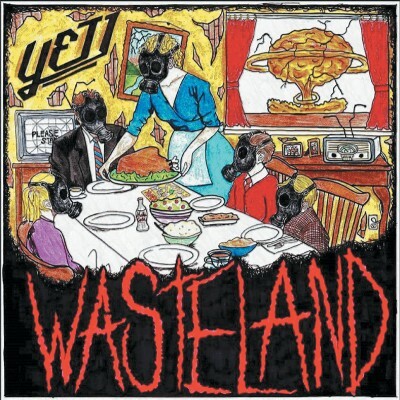 While only four tracks in length, the EP runs for 26 minutes, and it’s clear that Yeti are having fun playing. There are some quality riffs found throughout that got my head bopping on multiple occasions, and even though the songs are long, they don’t meander. Yeti know how to effectively repeat the riff. They don’t beat them into the ground, though, letting them hang around just long enough to be memorable. I don’t know why so many bands are content playing an excellent riff for four bars only to never return to it. Fortunately, Yeti don’t skip around—they let ’em ride. If there’s a fault to point out with Wasteland, it’s tempo. “Warpath” opens the album with a solitary guitar riffing away, and unfortunately, its tempo wavers. It was at that point that I started to notice there were some inconsistencies in tempo throughout Wasteland. Although the drumming is fitting, it seems to be just a click behind the beat throughout the EP with some fills being subtly fumbled. Drumming doesn’t have to be pushing the tempo, and for Yeti, a laid-back beat is appropriate—they just cross over into being off-rhythm at certain points. Tempo issues aside, it’s during “Warpath” that the first head-bobbing riff launches at 3:55, and it’s awesome.